I love to go thrift shopping at Goodwill–bargain hunting for a good cause? Sign me up! Besides, I’m way too lazy to have a yard sale,so whenever our closets start to overflow we put together a Goodwill bag and send our gently used items off to find a new home. There’s a MERS/Goodwill a few miles from my house, so drop off is easy. Then I loop around to the front of the store and browse for hidden treasure! Sometimes I find gems that are perfect just the way they are, like a set of rockin’ speakers we hooked up to our gaming computer or a great Cardinal’s t-shirt. But sometime you need a creative approach when thrifting. 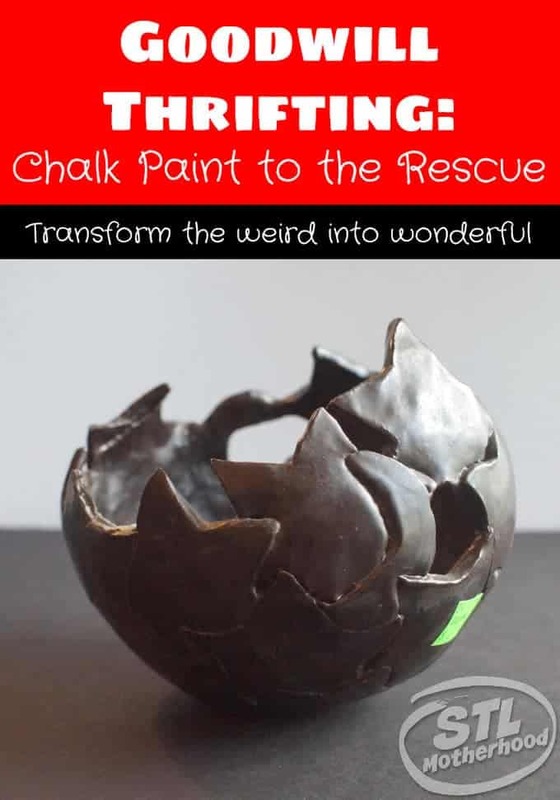 It’s amazing what you can transform with a can of spray paint and a little creativity. I’ve partnered with MERS/Goodwill for this post. They challenged me to do a little thrifting, transform my finds…and show them off on the blog! So the first thing I did was consult Pinterest. It wasn’t long before I had dozen of ideas! Of course you never know what goodies you’ll find at Goodwill, so it’s best to go shopping with an open mind. Their inventory is constantly turning over as new donations come in to the shop and old ones find new homes. 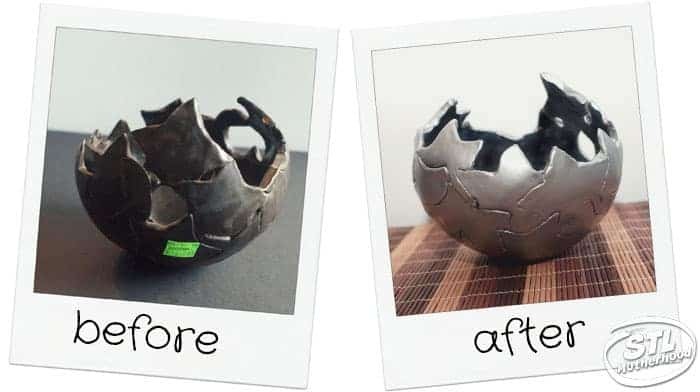 I saw a lot of objects on Pinterest upcycled with spray paint. I didn’t want to invest in a lot of new paint, so I picked two colors: a silver metallic and black chalkboard paint. Chalkboard paint is all the rage right now, and it’s so simple to apply with a spray can. There’s no need to prime or sand a piece before you paint, and it sticks to just about anything from wood to glass. 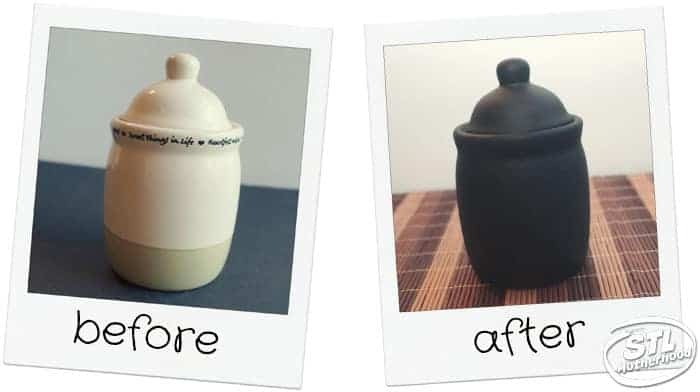 Chalkboard paint gives your thrifted treasures a nice stony black finish and you don’t even need to write on the item later–it’s a beautiful all by itself. 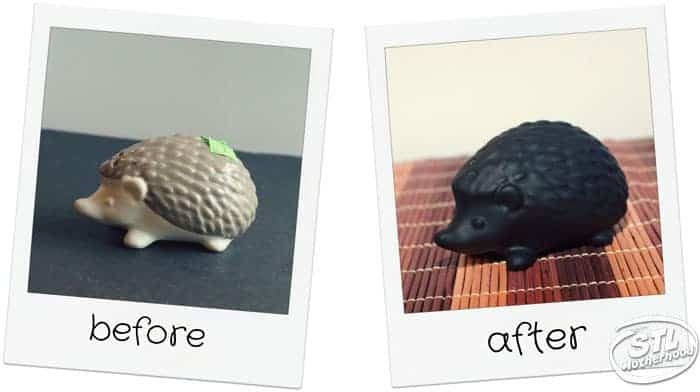 I saw a lot of ideas for turning figurines into fun art pieces by repainting them to look like porcelain or pewter. I decided to stick with my chalkboard paint and turned this lone salt shaker into a stone figurine. I plugged the holes with some air dry clay from the kid’s craft supply, then gave him a couple quick coats of paint. Isn’t he cute? And you can’t tell he’s a salt shaker either. I think he’ll end up in a terrarium I’m going to make out of a cookie jar I picked up at Goodwill. I’ll let you know how that goes! Pinterest is full of wooden bowls made elegant with gold or silver paint. 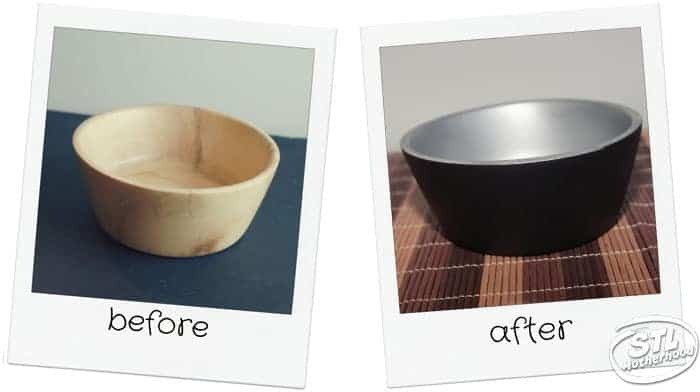 This wooden bowl was easy to transform without masking tape or brushes! I painted the inside silver first. After two coats of silver had dried, I flipped it over and applied the chalk paint. No masking required! This odd ceramic bowl with funky stars looks like it might have been a forgotten ceramics project. One corner was chipped off, but I knew that a coat of paint would cover that right up! I painted this one silver on the outside using spray paint, then later added black with a foam brush. I love the funky vibe–but I don’t know if I should put a candle in it, or potpourri? This cute little jar was a scented candle holder. I chipped out the old candle with a screw driver, removed the rubber lid gasket, then sprayed with chalk paint. After it dried, I put the gasket back in. Now I just need to practice my fancy handwriting! It would be a good spot to store change…maybe I’ll write “Girl’s Night Out” or “Vacation Fund” on it! I have a few more projects I’ll share with you next time! I picked up a lot of old books that were perfect for transforming, plus a number of picture frames that just needed a little paint. Also, Mitch is working on a special Minecraft upcycling project that he can’t wait to show off. Have you tried spray chalkboard paint on anything? Did you like it? 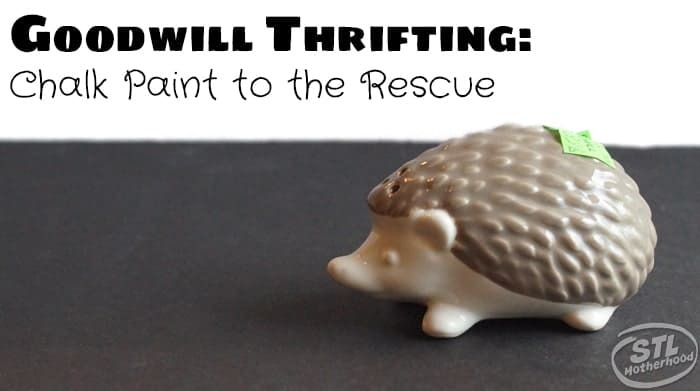 What thrift store treasures would YOU try to transform? Let me know in the comments! You can find your nearest Missouri Goodwill at their website here. You also might want to explore their newest outlet location in Bridgeton where everything is sold by the pound! !